Daniel Hugh McCorquodale, born July 14, 2000 in Austin, Texas, passed away on the morning of January 13, 2019 in Commerce City, Colorado. He was a resident of Boulder at the time of his death. Daniel left so many people behind who loved him. He was a friend, a leader, a talented student and a natural performer. He was driven and set out to accomplish his goals. 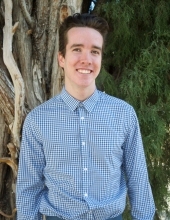 He was the recipient of numerous academic scholarships, and at the time of his death was enrolled in the Engineering Honors program at University of Colorado at Boulder. So many people have described him as a light and a guiding presence in life. In his short life, he traveled to many countries across the globe, as a volunteer and a student. He mastered two world languages. He wanted to make a difference; he wanted to change the world. In the lives of many people, he did exactly that. In his short time on Earth, he accomplished more than he knew. Daniel truly was a ray of sunshine. He was kind to everyone. He learned people’s names in amazing numbers. He reached out to almost every single person he ever met, across all generations and situations. He was generous with his time and energy and was a friend to all. Daniel was also very funny. He had a contagious laugh, and wasn’t afraid to be silly. He was equally comfortable talking to an audience of 300 people as he was being the neighborhood Easter Bunny, as he was talking one on one. He brought joy into many people’s lives on a daily basis. and Caleb, his first cousin, once removed, who were separated by distance, but nonetheless friends for life. 4490 Newland St, Wheat Ridge, CO 80033. To send flowers or a remembrance gift to the family of Daniel Hugh McCorquodale, please visit our Tribute Store. Reception to follow at the church. "Email Address" would like to share the life celebration of Daniel Hugh McCorquodale. Click on the "link" to go to share a favorite memory or leave a condolence message for the family.